Miss Magpie: Ripple Baby Blanket - Finished! I'm a little bit late with this post, I actually finished this blanket over a week ago, but what with all the festival prep I hadn't managed to take any pictures. You might remember me starting this blanket (click here for the post about it) back in May. I was hoping to have it finished in time for Larmer Tree and the truly awful weather we've had over the last month has probably helped to achieve that aim. Because we had to cancel our camping holiday and instead had a last-minute holiday to Wales, I used the journey times to make good progress. I still love the Rowan Handknit Cotton I used on this project, although I was a bit annoyed to discover halfway through a row that the white shade had a join in it which necessitated an extra two ends to be woven in, but hopefully you can't notice. This time around I didn't knot the ends as I changed colours; I tied them loosely until I came to weave them in and then just made sure I wove the ends in under the crochet loops, being sure to change direction at least once and also to go through the strand of yarn a couple of times to really make the tail 'catch'. Not knotting makes for a much smoother edge. With this blanket I purposely made the beginning and end purple sections larger than the ripples in the main body of the blanket and finished off by doing a row of single crochet down each side and then two rows of trebles. I think I may have put more stitches down one side as the border doesn't lie perfectly flat, but I haven't pressed or blocked the blanket yet so that may address the problem. So, here is the finished blanket in all it's glory, just in time for the festival. Speaking of which, I really am upto my eyeballs in work so you won't be hearing from me for a few weeks now. I promise to take lots of pictures of the festival and do a big Larmer Tree post when I get back. Keep your fingers crossed that summer arrives just in time for me. This looks great! I can't wait to try the ripple myself! 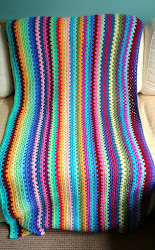 This blanket is beautiful - I've made several crochet baby blankets but they're all giant granny squares as that's the extent of my crochet knowledge... I must learn another technique before I get bored of it! Love those colours. The sense of security it gives, of course next to human warmth, is often irreplaceable. Even as an adult, most of us would love to sleep peacefully under a soft baby quilt.